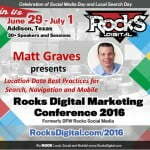 Tanya Smith is a creative social content strategist, soccer mom and geeky student of all things Internet, teaching service providers to leverage snack-size, microcontent for maximum social media visibility so they can shift from invisible to influential. Described as a “walking Google”, Tanya’s experience and branding perspectives have been featured in radio, print, and a number of well-known digital publications such as Visionocity and Bronze Magazine. As a former instructor and faculty member for the Workplace Coach Institute Inc. ™ in 2011, Tanya developed her first groundbreaking course on how to design a phenomenal online branding strategy. She has created a number of successful online courses ever since. Tanya has been a guest speaker for various national organizations and events, delivering a worldwide simulcast for the Army & Air Force Exchange Service (AAFES), delivering training focused on online branding and marketing systems for the University of Texas at Dallas’ executive coaching “Expert Forum” and other companies such as Alliance Data Systems (ADS). Formerly named #4 in the top 10 of Most Intriguing Women by the National Association for Women on the Rise, Tanya has also been referenced in the list of 50 Fabulous Women Entrepreneurs by Black Business Women Online, and named previously as one of the Top 100 Business Coaches to follow on Twitter by Evan Carmichaels. Tanya continues to set trends these days in social content marketing as a Certified Copyblogger Content Marketer and Digital Marketer Certified Social & Community Specialist. Research says the attention spans of human beings has recently decreased to 8 seconds – less than that of a goldfish! 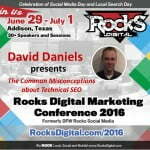 This only highlights the fact that it’s now more challenging than ever before to capture the eyes of your prospects on social media in hopes they will visit your blogs and landing pages, and ultimately become paying clients. In this presentation, Tanya Smith will share 5 key strategies to help you leverage high quality, short form text, visuals, audio and more in order to get more traffic to your amazing offers. Learn the 3 goals of snack size marketing, keys to repurposing your existing materials, and the #1 tool to put you on track to success with micro content. 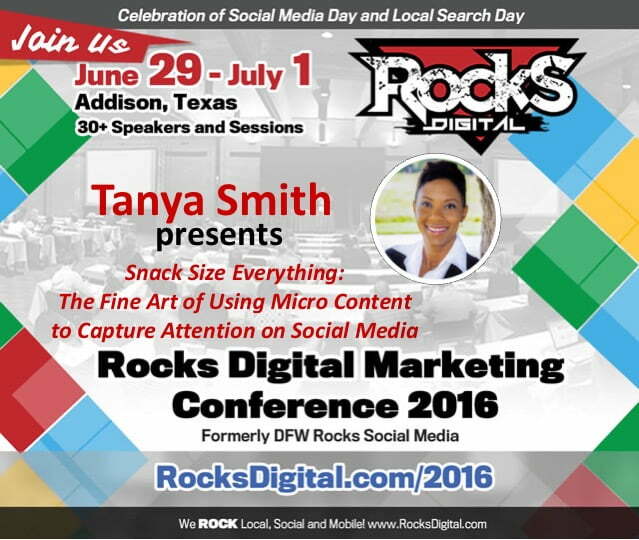 Hear @TweetTanyaSmith dish on memorable #MicroContent in #socialmedia at #RocksDigital 2016!